Mostly sunny, with a high near 56. West wind 7 to 9 mph. Isolated showers after midnight. Partly cloudy, with a low around 38. Breezy, with a west wind 5 to 10 mph becoming south southeast 19 to 24 mph after midnight. Winds could gust as high as 38 mph. Chance of precipitation is 20%. A chance of showers and thunderstorms, then showers and possibly a thunderstorm after noon. Some of the storms could produce small hail. High near 56. 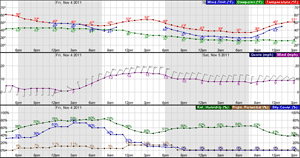 Windy, with a south wind 24 to 33 mph becoming west southwest in the afternoon. Winds could gust as high as 47 mph. Chance of precipitation is 90%. Showers likely and possibly a thunderstorm before midnight. Mostly cloudy, then gradually becoming mostly clear, with a low around 30. Windy, with a west northwest wind 33 to 38 mph decreasing to 23 to 28 mph after midnight. Winds could gust as high as 55 mph. Chance of precipitation is 60%. Sunny, with a high near 52. 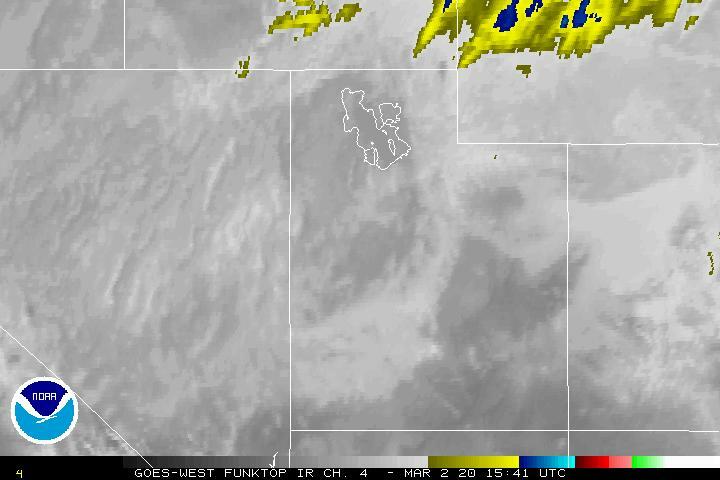 West southwest wind 15 to 21 mph. A slight chance of rain and snow showers. Partly sunny, with a high near 48. Chance of precipitation is 20%. A slight chance of snow showers. Partly cloudy, with a low around 28. A chance of snow showers. Some thunder is also possible. Mostly cloudy, with a high near 49. Rain and snow showers likely. Mostly cloudy, with a low around 33. Rain and snow showers likely. Some thunder is also possible. Mostly cloudy, with a high near 46. Rain and snow showers likely. Mostly cloudy, with a low around 27. A chance of snow showers. Partly sunny, with a high near 35.